Has anyone lost a job or jobs as a result of mistakes made while in the peri or menopausal state? I've been having a hell of a time these past few years. How do you do it? Hello kado! Welcome to our forum where women can be themselves and everyone understands!! Are you single too? I have been for 23 or 24 years (can't remember exactly!) and I've found that it's a bit more serious when you can't seem to hold on to a much needed job! About 10 years ago I broke my ankle and ended up losing my sales job because it took over a year to recover. I've been self-employed ever since and THAT's not easy either!! OMG, I am sooo glad this came up!!! I have the same fears, there are some days my symptoms just flatten me and how the heck do u xplain it? And yes the brain fog. I am able to get away w/working part time in a position that gives me quite a lot of independence, I almost had to set things up that way b/c of this hormonal roller coaster. OH YES! I had to take a medical leave in 2002 for several months when my peri symptoms hit me like a brick wall. Back then I was diagnosed with anxiety disorder yet all the antidepressants and antianxiety meds. that they put me on only provided minimum relief. It wasn't until I tried my first hormone patch that I found some relief. That hormone patch confirmed that my problem was definitely hormonal. Even now many days it's an effort to make it through the work day. I pray a lot. I too have been experiencing some anxiety about this issue. I have been in the law enforcement field for 10 years. The last 9 years have been as a civilian in an administrative capacity. One year ago I gathered all my courage and energy at the ripe young age of 44 and went through the grilling 4 month Criminal Justice Academy which is run like a military academy with academic and physical tests. I passed the Academy, the state test and the 4 month Field Training phase. For the last year I have been working as a road patrol deputy. Since January when I started the Lupron shots I have been experiencing anxiety, confusion, forgetfulness, lack of confidence, headaches, hot flashes, nausea/dizziness etc. that comes with menopause. My doctor wrote me a note recommending light duty because I started getting wrote up for mistakes at work. I have been on light duty since until my surgery in April. I have been a little anxious about when I am recovered but still menopausal, will I be able to do my job? It is a male dominated field anyway and it was difficult explaining to my Alpha Male Sergeant and Lieutenant about what was happening without them looking at it as a "female" thing, reinforcing the thought that females shouldn't be on road patrol anyway. The way I am feeling right now I dont' want to continue on road patrol. I want to work something with less stress because I am afraid I will mess up. 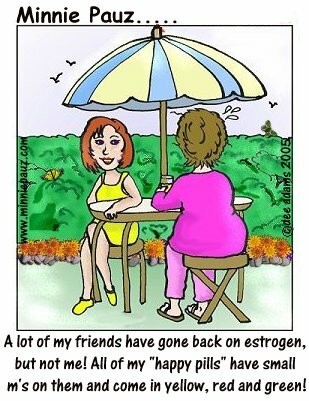 But is that my menopause speaking or is it wisdom? I will just take one day at a time and see what happens I guess. It is nice to know that others are struggling with these issues too. Wow, kscop! 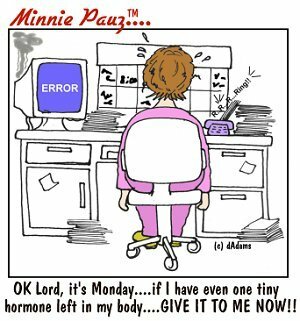 That is the ultimate situation regarding how our hormones affect our work! When is your surgery....are you having a hysterectomy? 1. Make an effort to become a little more organized than you are normally, like literally taking notes to remind yourself of certain tasks, meetings, schedules. 2. Keep your sense of humor! We've GOT to laugh at ourselves because if we don't the worrying will show in our faces (scowling) and in our attitude at work! Other people are much more forgiving when we allow them to be "in on the joke", so to speak. They relax more when they see that we are not worried..... and when we are not worried, we're not stressed and we can actually remember things much better! 3. If it's getting really serious at work.....go to your supervisor and explain that you're getting to the age where your hormones are starting to kick-box each other, so you are working with your doctor to get them into balance again, but you just wanted them to know that if you seem a little "out of sorts" occasionally, that's it.......again, a little humor can go a long way. If anyone else has some suggestions.....lets hear them! I am so glad that this topic came up. I was thinking that it was only me that was spacey at work. I have been at the same job, a high school teacher, for 30 years, with generally good observations. Then last year I received my first negative report. After a discussion with the administrator who did the report, we decided that it was my health that was causing the problem. I vowed to do better. Then this year, another administrator walked into my classroom. It was a Monday and I had had a particularly bad weekend. I taught a good lesson, worked with the students efficiently, but still received a negative report because my paperwork was not done. I still am a good teacher but can't seem to get ahead with all the reports, lesson plans, etc. that are part of my job. I take all kinds of joking about my "lists" but that is the only way I can get anything done in a day. I know that the hormone shifts are affecting my work performance. 1) hormonal migraines 2) I keep losing my clipboard (my short term memory LOL) 3) My department is over 150 "man hours" short a week lately and I'm going to make a job (company) change, while still trying to be effective at this workplace. WHEW!!!! I've just decided that all I CAN do is put one foot in front of the other. If I have to leave something undone or not done to my satisfaction I just try my best and that's that. My current work doesn't know about the job change yet but I have that letter all ready to go and it does free me up to not worry too much. I have a wonderful husband who is sooooo understanding about this time in our lives. Good for you, Pam!! We should be doing work we enjoy at this stage in life!! Life's too long to be doing something we don't want to be doing and life is too short to be doing something we don't want to be doing!!!! Have you ever read Barbara Sher's books? You should visit her website at http://www.barbarasher.com and go to the message boards....oh my god, will your eyes be opened to the possibilities!! Thanks for the link, I didn't get time yet to look at it all but I put it in my favs for later (at home on "lunch") BTW LOVE thie latest cartoon!!!!!! It's soooo me, gave my brother a card that said "there are two kinds of people in the world....those who like chocolate and b*****s LOL. With peri and PMS going on at the same time I really fall into both catagories!!! When you subscribe to the monthly newsletter, you get to view the entire list of cartoons!